The most powerful leaders in history use emotion to be true Authentic Leaders. This next part... you might not like. That emotion is a position of vulnerability. 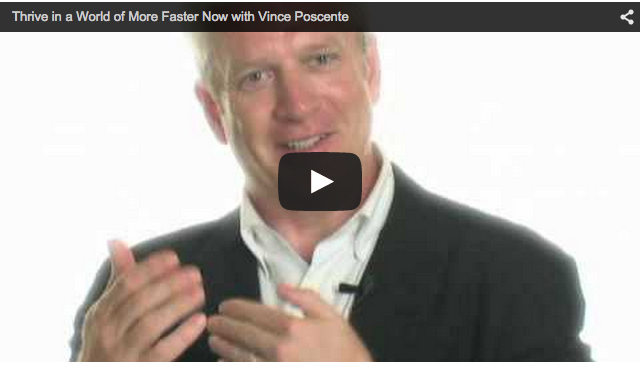 Having delivered over 1,500 keynotes with an authentic leadership style, Vince Poscente has some valuable insight on the power of authentic leadership. He says, "You can't show your true authentic self without being somewhat vulnerable." But how can a powerful leader not show weakness? First, don't confuse weakness with honesty. When an executive is delivering a keynote address, honesty is compromised when there is a barrier to vulnerabiity. A scripted speech, mechanically delivered via a teleprompter is such a barrier hazard. But, honest, true thoughts following a well thought out speech shows your group you are leader to be trusted. Second, vulnerability is not weak when it is from the heart. Talking about your kids, or your parents, or a time when you struggled shows your employees you are human. Third, authenticity on the platform shows courage. The second your lips start flapping, your audience will start assessing your authenticity. To be open, honest, vulnerable and clear is the quintessential act of courage on the platform. Be honest in your word and demeanor. Speak from the heart, while you lay out your vision. Authenticity shows courage. People follow courageous leaders.